While I was cooking dinner, the kids were upstairs playing Lego. I realized that I have potatoes cooking for mashed potatoes and have no milk to mix into them. I yell up that I need to run to 7-11 for milk, and will be back in 5 minutes. For added measure, I add... "Be Good." 5 minutes later, as I'm getting out of the car, I can hear the music blaring from inside. But they were rocking to Vacation Bible School Songs. The excitement leading up to last night was almost unbearable. Not only did we have tickets to Lego KidsFest, but we decided to make a little mini vacation out of it and also had a room booked at the Marriott, which is conveniently attached, by skywalk, to the convention center. The kids and I left around 12:30 and arrived in Richmond before two. We were greeted and promptly checked in. We dropped our stuff in the room and headed down to lunch. My brother and nephew showed up just a while later. We took them to drop off their stuff and to the Convention Center we went. Thanks to Daddy and Grandma and Papa, wee had money to SHOP! As you can see, there is so much to do at Lego Kidsfest. There were many other available activities that we did not do. We let the kids lead and choose what they were interested in doing. 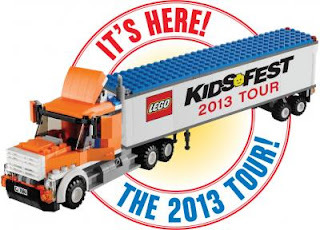 We had an awesome time and can't wait for Lego KidsFest to come near us again. Thank You to US Family Guide for the Tickets and the Marriott for a place to stay. Our mini Vacation was a ton of fun. If you get the chance, you need to check out Lego KidsFest for yourselves.